Josh Bloom talks pharmaceutical shortages. Curious Wavefunction writes about the relationship between modelers and med chemists. I find this to be a bogus trend story, but maybe I'm wrong. John has some very interesting job seeking advice. Gaussling has some operational observations about the #SheriSangji case. Adam posts a clever cartoon. Nocera is going to Harvard, Paul scoops the internet. Jyllian wants to know your worker safety habits. Cue/response/reward is fun to think about. Want to host a PBS show on chemistry? Who wouldn't? David liked the IBM-Zurich story on seeing the charge distribution on a single molecule, too. I loved this story of a press forger at Alcoa. Did I miss anything? Let me know in the comments. Applies complete understanding of organic/process chemistry and bulk pharmaceutical batch operations. Provides process-engineering support and troubleshoots routine and non-routine process and process equipment problems as necessary to meet all production and customer commitments in support of manufacturing bulk pharmaceutical (API) chemicals. Independently manages project activities and works as part of a team while communicating effectively to support rapidly changing business needs. Directs activities of workers who operate and control such equipment as reactors, pumps, valves, tanks, boilers, compressors, pipelines, and centrifuges to effect the required chemical or physical change. I guess that extra $25k might help a manufacturing engineer to enjoy life more, I suppose. The aforementioned experiments are also useful for inferring the cause of the higher amounts of 1 observed at the end of the reaction at larger scales. Bourne  has identified three mixing stages for single-phase fluids: (a) distributive, or macromixing, in which large fluid eddies exchange positions and mass, but with compositional uniformity occurring only at a scale greater than the eddy size; (b) dispersive, or mesomixing, in which larger eddies are reduced in size due to turbulent shear and finer-grained mixture forms, but with the mixture remaining highly segregated at the molecular scale; (c) diffusive, or micromixing, in which molecular diffusion occurs over short distances between finely dispersed structures to give a mixture that is randomized on the molecular scale. Good micromixing is thus a prerequisite to avoiding compositional inhomogeneities on the molecular scale (i.e., high local concentrations) that can impact selectivity of chemical reactions. The macromixing time typically increases with increasing scale. For example, when scaling up at constant power per unit volume in geometrically similar vessels, the macromixing time varies as the 2/3 power of the vessel diameter. At constant power per unit volume, however, the micromixing time is not impacted significantly. Thus, given that the stages occur mostly in series, one should expect a longer time to achieve uniformity at the molecular scale with increasing scale (i.e. macromixing becomes the limiting mixing process). I don't know what I thought about the time it took for material to achieve homogeneity in a 1 liter flask (in this case.) But now I'm aware of the eddies! Apurva Chaudhary, Michael J. Girgis, Mahavir Prashad, Bin Hu, Denis Har, Oljan Repicˇ, and Thomas J. Blacklock. "CO2 Offgas as a Mechanistic Probe and Scale-up Tool in N-Acylations Using Mixed Anhydrides from Amino Acids and Isobutyl Chloroformate." Organic Process Research & Development 2003, 7, 888−895. Bourne, J. R. Mixing in Single-phase Chemical Reactors. In Mixing in the Process Industries, 2nd ed. ; Harnby, N., Edwards, M. F., Nienow, A. W., Eds. ; Butterworth Heinman: Woburn, MA, 1992. Organometallics panel discussion: industry vs. academia, why no #chemjobs? Organometallics recently published a panel discussion between an impressive panel of professors and industrial experts; they talked about the state of organometallic chemistry in 2011. Esteemed friend of the blog See Arr Oh is covering the research oriented sections at Just Like Cooking today as well. Go on over there and read it. Joachim Ritter: [SNIP] What is involved in not just making 100 mg or a gram of a material, but 100 million pounds, and what are the implications? Challenges in the industrial world include space−time yields, purification methods, catalyst recovery and lifetime, solvent usage, etc. These topics sound straightforward, but when you’re actually working in industry developing new processes with broadly trained junior chemists coming straight out of top schools, sometimes you see that very talented chemists have a hard time connecting to these challenges. So I do feel there is something to be done in education. In addition to an in-depth drive toward the newest cutting edge developments in science, there needs to be a perspective of today’s problems in the context of chemistry. Good morning! Between February 23 and February 27, there were 54 new industrial positions posted on the ACS Careers website. Of these, 25 (46%) were from Kelly Scientific Resources. Logan, UT: Frontier Scientific, Inc. is looking for a Ph.D. chemist with experience in porphyrin chemistry. How to attract scientists to Utah? Good skiing is what I'm going to go with. Florence, SC: IRIX Pharmaceuticals is a frequent visitor to the ACS Careers website. They're looking for a Ph.D. process chemist with 2-3 years of experience. Top pay is a little low slightly under the median. Elkton, MD: W.L. Gore is looking for a Ph.D. material scientist to work on flame retardant materials. Hmmm: So 3M is hiring Ph.D. chemists everywhere, apparently. US, Brazil, China, India. Which one of those might not be real? Riyadh, Saudi Arabia: SABIC, back with 3 more positions. Probably Connecticut: Cytec Industries would like to (once again) hire a postdoc for a polymer research program. Where this position is, of course, is not mentioned. ACS Career Fair watch: 15 positions now for the ACS Career Fair, 6 positions for the Virtual Career Fair. Villanova, PA: Villanova University is looking for a tenure-track assistant professor of analytical chemistry. Fulton, MO: Westminister College (home of the Iron Curtain speech) is also looking for an assistant professor of analytical chemistry. Millersville, PA: Millersville University desires an assistant professor of physical chemistry. Building built in 1999! Ann Arbor, MI: The University of Michigan is hiring a postdoctoral fellow in radiochemistry -- previous experience in PET imaging synthesis preferred but not required. Nice postdoc salary, too! Huntington Beach, CA: Golden West College wishes to hire a M.S./Ph.D. instructor of chemistry. A lovely town -- be sure to visit the boardwalk. Colorado Springs, CO: Colorado College is looking for a Ph.D. biochemist to teach general and biochemistry. At the rate it is hiring people and investing in its R&D infrastructure, it shouldn’t be long before China’s HEC Pharm becomes as well-known as India’s Ranbaxy Laboratories or Dr. Reddy’s Laboratories. This obscure generic drug maker, with headquarters in the gritty industrial city of Dongguan in southern China, aims to launch innovative new drugs in China and, eventually, in the U.S., Europe, and other developed markets. At its R&D complex, the company has more than doubled its technical workforce during the past year to 1,200 researchers, most of whom live in company-provided housing. It is completing construction of two new buildings that will house biology labs and research facilities for clean energy materials that will be developed mostly by the firm’s chemists. And within a few months, it will break ground on a 21-floor apartment complex to house new hires and on a 12-floor research lab for new-drug R&D. In May 2011 HEC completed construction of its generic drug labs. [snip] Hiring qualified researchers is a big part of HEC’s strategy. To fill its technical positions, it recruits by offering competitive salaries, family housing, subsidized meals, and other benefits. Fresh Ph.D. graduates get a starting salary of $24,000 and regular raises—a good wage by Chinese standards, says Tommy Lin, HEC’s director of intellectual property. The company hopes to employ 2,500 researchers within three years. Be sure to watch the video to see the "HPLC forest" at 41 seconds in. I'm pretty skeptical that they're all running (where are the associated computers? Why is it so clean?) But it's a pretty impressive collection, for sure. The labs look like labs, FWIW. For years, many of those in the Ivory Towers protected by the Tenure Moat were waving the red flag of not having enough chemists. There were many Chicken Littles with predictions about dire consequences of the falling sky. There is nothing new about the shortage of jobs, which started many years ago. Sputnik made us realize that science education was inadequate in the U.S. and started a rush to produce more chemists. However, there was a chain reaction. Many graduates went to academe to produce more chemists. It was evident that somewhere the process had to come to an end, but those who dared to question the lack of proper attire of the king were ignored. In the 1960s, the ACS Employment Clearing House showed four jobs available for everyone who was looking for a job. Generally those were not recent graduates, because companies went to the universities to interview and hire the students before they had graduated. Starting in the ’70s the situation changed: Job seekers outnumbered the jobs offered by a 3:1 ratio. The most alarming fact was that the job seekers were mostly young graduates. Midcareer chemists who were terminated considered it more and more hopeless to sign up. [snip] We have the best educational system in the world; our graduates receive excellent preparation to go to another university and to produce graduates with the same capability. However, we do not prepare them for industrial employment where most of the jobs are for chemists. In order to make graduates suitable for industrial jobs, the curriculum has to be changed. Unfortunately, academe needs cheap labor for work that can result in publications to obtain tenure and grants. Teaching does not provide tenure; it has become a burden and secondary to the pursuit of fame, grants, and tenure. Until the system is changed, the students are the ones who will have difficulties in their job hunt. I don't really know what to say about this, in that it's difficult for me to evaluate the factual/historical statements. Someday, it might be nice to get into a room of old ACS hands and get an oral history of their ideas about chemistry jobs. The eight-story, 660,000-square-foot Williamsburg plant was originally eighty-sixed in 2008... The building's unique (FDA-approved) facilities are ideal for food production. For example, KBBK will be able to brew tea and store live cultures for its kombucha at a specific, controlled range of temperatures. Losing Pfizer was a big blow to Brooklyn but I was determined to make sure that this building continued to provide high quality jobs to Brooklynites... Like Pfizer, these companies are starting small, but one day they may be as big or even bigger than Pfizer and they will never turn their back on their place of birth, Brooklyn, U.S.A. It's not like Pfizer was going to keep the Brooklyn site open forever -- I assume that there was a great deal of emotional attachment to the site that allowed it to remain open as long as it had. Also, using it as a tea-brewing facility is better than nothing. A job making tea is better than no job at all. But there's something vaguely distressing about a business class doesn't sees the manufacturing sector as a place to make money. Sometimes I wonder if they see it at all. There's a great deal of hoohah about science and technology careers right now and how they're the Jobs of the Future. While I think that's mostly correct, this graph should be a corrective of a sort. 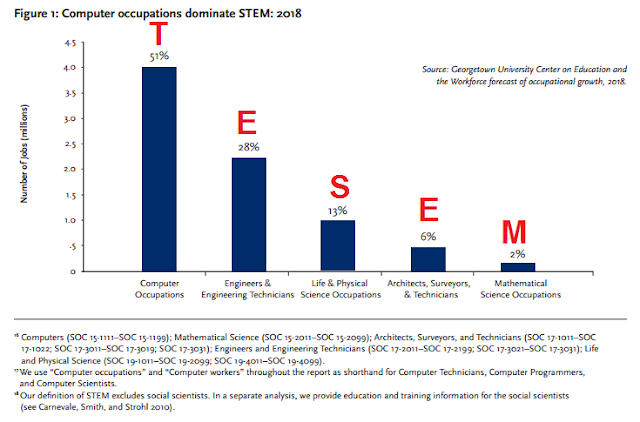 It's by the Georgetown Center on Education and the Workforce, and it's their projection of what the STEM job market will look like in 2018. I've added the red letters for emphasis. They project that fully 51% of STEM jobs will be computer (that is, Technology) related. Good morning! Between February 21 and February 22, there were 23 new positions posted on the ACS Careers website. Of these, 3 (13%) were academically connected and 9 (39%) were from Kelly Scientific Resources. Richmond, VA: Tredegar Film Corporation is looking for an experienced B.S. analytical chemist; instrumentation experience (SEM, FTIR, DSC, TGA) is desired. Chattanooga, TN: Invista desires an experienced B.S. chemist for a polymer product development associate position. Experience with thermosetting polymers desired. And you get to work for Koch Industries! A broader look: Monster, Careerbuilder, Indeed and USAjobs.gov show (respectively) 263, 733, 3,065 and 45 positions for the search term "chemist." What is the demand for computational chemists in the pharmaceutical industry? Careful, only some jobs are at risk -- those in pharmaceuticals. Not even all of those are at risk. Computational chemists are in high demand for work in pharma. ...Pharma is towards computational methods of R&D versus combinatorial/high-throughput because of the very virtue that it is cheaper, and has high reward potential. Why so hard to believe? It makes sense for a company to invest a rather small amount of time and money for preliminary computational work, than to invest a larger amount of time and money to develop new therapeutics. I think time is the more convincing argument, simply due to the fact that companies race against each other to produce something viable. There are far fewer computation slots at pharma companies than bench chemistry slots. (Perhaps things are changing, post-outsourcing?) The maximum ratio of computational to bench chemists seems to be far below 1:1 and closer to 1:5 or 1:10. There hasn't been any major uptick in hiring of computationalists for pharma in the last two or three years. Maybe I'm wrong? I'm defining a computational chemist as someone who sits behind a desk, does not have a hood in the lab, does docking studies, etc. ACS statistics don't drill down that far, so there's that,too. Readers, doubtless I'm incorrect about something. Comments? E-mails? Process Wednesday: Hey, what's this powder? 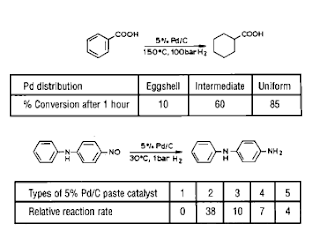 both the Pd salt impregnation and reduction steps; rate and order of addition of the reagents; efficiency of the final washing/filtration step; etc. Clearly a vast number of combinations of the above is possible, all capable of yielding an end product that could accurately be described as '5% Pd/C paste' with each being assigned some unique identification code by the manufacturer. One of the key parameters that can be controlled is the location of the Pd on the support. At one extreme the Pd can be entirely located at the surface of the individual carbon particle: eggshell metal distribution. At the other extreme the Pd can be evenly distributed throughout the particle: uniform distribution. Somewhere between these two extremes is the intermediate distribution. It does not follow that catalysts with eggshell distributions are invariably the most active. For example, [see top reaction scheme]. At higher pressures, catalysts with the same total metal loading but deeper metal locations tend to be more active than those with eggshell distributions because of their higher metal dispersions. reaction rates have been observed [see bottom reaction scheme]. To achieve reproducible results, it is absolutely essential therefore to ensure that the same catalyst formulation, identified by the manufacturer's code, be used throughout any evaluation programme. MG is a family friend and an state prosecutor. He is not in any way associated with the #SheriSangji case, nor is he in the same geographical area as the Sangji case. I’ve supplied him with most of the details of the case and links to the relevant information. As the Sangji case is quite technical (e.g. the charges are under California’s labor statutes, the chemistry involved, etc. ), I’ve asked MG to focus less on the specific legal aspects of the case. Rather, I thought he might be able to help us try to understand the context around prosecutorial decision making and the impact of Naveen Sangji’s letter to Los Angeles County District Attorney Steven Cooley and his decision charge both UCLA and Professor Patrick Harran. This e-mail exchange was lightly edited by CJ and checked by MG before publication. CJ: How does a DA decide to charge a person or an institution with a crime, especially when it's not a "typical crime"? MG: In charging an individual a prosecutor must consider the facts specific to the incident, the social harm by the crime, and whether or not the evidence exists to reasonably believe that the particular individual has committed the crime, and whether charging that person is warranted by an interest in justice. That means different things in different situations. I have often declined filing state charges on an individual because I believe the crime can be better handled through the applicable municipality. I once had a police officer ask me to charge a girl with stealing about $10 worth of items from a local retailer. She was arrested for shoplifting. Upon reviewing the charge and the offender’s lack of any criminal history, I told the officer that I felt the individual should receive a municipal citation rather a state level criminal charge. The officer was not very happy with me. I could have easily charged the defendant. There was no question as to whether the evidence was sufficient. She was caught on video surveillance. However the girl’s criminal history was clean. Certainly stealing any item of any value cannot be condoned but municipalities have the best infrastructure for handling these lesser offenses. But simply charging someone because you have the power is wrong. Frankly it’s a misunderstanding and abuse of the power a prosecutor holds. Charging an organization is generally a completely different ball game from charging an individual. Most organizations can be held accountable through civil liability, thus making these types of prosecutions rare. CJ: How much does the desire of the victim's family play into the DA's decision? MG: A DA should not charge based on emotion. Everybody's doing it, part 2. Really, the last meme-related joke for a while. Good morning! Between February 16 and February 20, there were 117 new industrial positions posted on the ACS Careers website. Of these, 77 (66%) were posted by Kelly Scientific Resources. Fremont, CA: ChemTrace is looking for a Ph.D. analytical chemist with 2-3 years experience. Salary range posted. Riyadh, Saudi Arabia: SABIC is hiring, with 3 positions posted. ACS Career Fair watch: Still just 6 positions. Oh, Kelly: Call center positions? Seriously, Kelly? Allentown, PA: Muhlenberg College is looking for a Ph.D. organic chemist to fill in a 1-year sabbatical. Organic lecture, laboratory and possibly an advanced class will be on the teaching agenda. Mobile, AL: The University of South Alabama is searching for a tenure-track assistant professor; biochemistry lecture, as well as general and organic chemistry will be your responsibilities. Moorhead, MN: Concordia College wishes to hire a M.S. 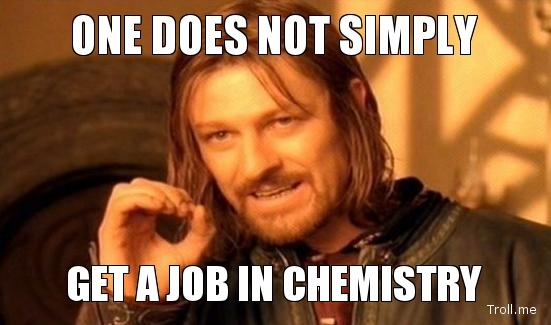 chemist for a one-year teaching sabbatical; analytical and general chemistry will be your responsibilities. "Tenure-track appointment at the assistant or associate rank effective fall 2012 to teach upper-level organic chemistry and introductory general chemistry. Ph.D. in Inorganic Chemistry and teaching/research experience required." Manufacturing plants coming back from Asia? Knowledge@Wharton: What are some of the other factors that you think are making it possible for U.S. companies to become more competitive in manufacturing? Sirkin: I think that we continue to focus on productivity of our work force. We are growing productivity quite nicely -- not at 8% a year, but at a substantial rate. U.S. companies are beginning to realize there are some problems with producing far away, that there are actual costs to that. I remember one CEO, when he worked out the economics, said the best thing for him was that his wife wouldn't bother him at two o'clock in the morning because he was on the phone. And he didn't have to fly 6,000 miles to go see his factory. That's an intangible, but it's real, and it points out the value of being close. When wages were 58 cents an hour when China entered the WTO, it was a very simple decision to go to China because [the wages] were so low. But those wages have gone up dramatically, and they continue to go up dramatically. Now it's not such a simple decision. Companies are beginning to rethink it. We expect over the next few years that there will be a lot of rethinking because manufacturing in the U.S. is becoming very competitive. Knowledge@Wharton: Could you give examples of companies that are driving this renaissance in manufacturing? And what are some of the kinds of jobs that are coming back? Sirkin: There are a lot of companies that are doing it. Again, I think we're still in the early stages. You see big companies like National Cash Register -- NCR -- that was manufacturing their ATMs in China for the U.S. and is now manufacturing in Columbus, Georgia. You see Ford adding jobs into its plants. I think they committed to 12,000 jobs. And you see companies like General Electric adding capacity to produce water heaters in their Louisville, Kentucky, plant. It's also smaller companies. So Farouk Systems, which makes hair dryers, has moved I think 1,500 jobs back from China to the U.S. You see Coleman, the manufacturer of water coolers, starting to build water coolers in the U.S. I can go on and on and on with the list. Every day we seem to find more and more companies that have made the decision. They're realizing that the total costs of manufacturing in China -- with the wages being higher and all the other intangible issues -- are starting to make it just far more economic, far more logical to do this. Now some people may think that means factories will close in China. That's not going to happen. That's not going to happen because of the way the Chinese economy is structured. China's growing 8%, 10%, 12% a year. China actually needs to build more factories just to support the domestic demand. So it's not about companies making decisions to close a plant in China. Ironically, it's the fact that the Chinese economy is growing so rapidly that makes it possible for U.S. companies to very quickly build plants in the U.S. because they need to put another plant in their system. They can just convert the stuff they used to ship from China to the U.S. to domestic consumption in China, and then just build the plant in the United States. So ironically, China's success is what's causing this manufacturing renaissance. Well, I hope that's true. Still, companies involved in food safety say that they also hire analytical chemists who have gained related experience outside of the food industry. BASF, for example, favors candidates who have previous experience in a current Good Manufacturing Practices-regulated environment, such as the pharmaceutical industry, Webber says. To fill food-safety positions, BASF generally hires B.S.-level chemists, or those with undergraduate degrees in food science or a related field, who are adept in good documentation practices and who can demonstrate great laboratory and problem-solving skills, she adds. Sounds interesting. I note that I would not like to mention that I'm a food safety chemist at a cocktail party -- listening to other people's theories about food safety does not sound like fun. Good news, bad news: how is the economy doing? First up, housing starts: "Privately-owned housing starts in January were at a seasonally adjusted annual rate of 699,000. This is 1.5 percent (±16.8%) above the revised December estimate of 689,000 and is 9.9 percent (±14.2%) above the January 2011 rate of 636,000." And new unemployment claims: "In the week ending February 11, the advance figure for seasonally adjusted initial claims was 348,000, a decrease of 13,000 from the previous week's revised figure of 361,000. The 4-week moving average was 365,250, a decrease of 1,750 from the previous week's revised average of 367,000." Again, none of this is like crazy insane boom times data. But it all reflects an economy converging on normalcy and I think it's plausible that we'll see convergence at an accelerating rate. The things to watch for are spikes in rents and gasoline prices. The Federal Reserve will have to hold its nerve through an inflation panic. I would invest in things that you think oil-exporting nations are likely to want to buy. But at least four downside risks are likely to materialize this year, undermining global growth and eventually negatively affecting investor confidence and market valuations of risky assets... ..the eurozone is in deep recession, especially in the periphery, but now also in the core economies, as the latest data show an output contraction in Germany and France. The credit crunch in the banking system is becoming more severe as banks deleverage by selling assets and rationing credit, exacerbating the downturn... In China, the economic slowdown under way is unmistakable. Export growth is down sharply, turning negative vis-à-vis the eurozone’s periphery. Import growth, a sign of future exports, has also fallen. ...Elsewhere in Asia, Singapore’s economy shrank for the second time in three quarters at the end of 2011. India’s government predicts 6.9 percent annual GDP growth in 2012, which would be the lowest rate since 2009. Taiwan’s economy fell into a technical recession in the fourth quarter of 2011. South Korea’s economy grew at a mere 0.4 percnet in the same period—the slowest pace in two years—while Japan’s GDP contracted at a larger-than-expected 2.3 percent, as the yen’s strength weighed down exports. ...while U.S. data have been surprisingly encouraging, America’s growth momentum appears to be peaking. Fiscal tightening will escalate in 2012 and 2013, contributing to a slowdown, as will the expiration of tax benefits that boosted capital spending in 2011... Finally, geopolitical risks in the Middle East are rising, owing to the possibility of an Israeli military response to Iran’s nuclear ambitions. With so many risks in so many places, investors, not surprisingly, will eventually prize liquidity in their portfolios, while shunning riskier fixed assets again when these tail risks materialize. That is yet another reason to believe that the global economy remains far from achieving a balanced and sustainable recovery. Who to believe? I have no idea. Can a grad student ever win against a professor? The fantastic discussion about the Michigan grad student and her advisor led me to a basic thought about graduate school, which is that it's a system that's naturally set up for poor outcomes for graduate students if a graduate student were ever to seriously collide publicly* with a professor. I've drawn the oversimplified chart to the right to illustrate my thought process. 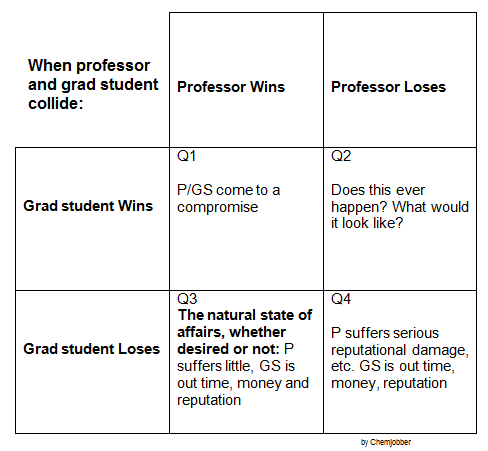 Whenever a graduate student and a professor conflict and a compromise cannot be reached, there are 3 possible outcomes, represented by quadrants 2, 3 and 4. 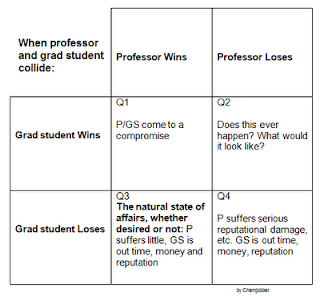 The Michigan case started at quadrant 2: by dismissing the student, there was not much reputational harm to Professor Goldman. The cost to Ms. Dibbern includes reputational damage and opportunity costs associated with being removed from a graduate school program. By appealing to the university administration and going public, Ms. Dibbern has moved the outcomes to either quadrant 2 or quadrant 4. The provost's statement of support for Professor Goldman indicates that quadrant 2 is unlikely; it remains to be seen whether Professor Goldman suffers reputational or career damage associated with the case. What does this chart tell me? Like @UnstableIsotope says, it might point to a need for a formalized process to deal with graduate student dismissal. It also says to me that it's best to attempt to compromise with your professor -- you're unlikely to win a public battle. If a public battle results, lose/lose just might be your best outcome. Readers, where am I wrong? *Publicly = the conflict is known outside the professor's laboratory. Good morning! Between February 14 and February 15, there were 12 position posted on the ACS Careers website. Of these, 2 (17%) are academically connected. Englewood, CO: Gevo, Inc. is a biofuels company; they're looking for a B.S. chemist to be an analyst. 3-5 years of LC experience and knowledge of ASTM fuels analysis desired. You again: Pfizer is looking for 3 positions: two B.S./M.S. biotransformation/structure elucidation specialists (ADME?) (Groton) and a Ph.D. synthetic organic chemist with only postdoctoral experience (La Jolla). La Jolla is lovely this time of year. Now that's what I'm talkin' about: Hewlett Packard is searching for a Ph.D. polyurethane synthetic chemist at their San Diego location; they're paying 90k to 120k. Zeroes! : Life Technologies (Eugene, OR) desires a B.S./M.S./Ph.D. organic chemist for a process/production role. 0-3 years experience for an M.S./Ph.D., 3-6 years for a B.S. position. Akron, OH: Goodyear is looking for a Ph.D. polymer chemist to be a metrologist; this is a postdoctoral position. San Diego ACS career fair watch: 6 ads up so far, including one in India. A broader look: Monster, Careerbuilder, Indeed and USAjobs.gov show 257, 738, 3,161 and 49 positions for the search term "chemist." Reslurrying is a technique that isn't much used in academic organic chemistry. I suspect that it has much more to do with scale than anything else -- why think about a quicker technique than recrystallization when you're not worried about saving much time? Nevertheless, if you can find a solvent that your product is not very soluble in, and which the impurities are soluble, it might be a good reslurrying solvent (as well as a pretty decent recrystallization solvent). Simply toss your crude product in, stir for a while and filter. Reslurrying a solid can sometimes be an attractive alternative to recrystallization. Reslurrying is analogous to trituration. Since attention does not need to be paid to dissolving and recrystallizing, reslurrying is less labor-intensive than recrystallization. 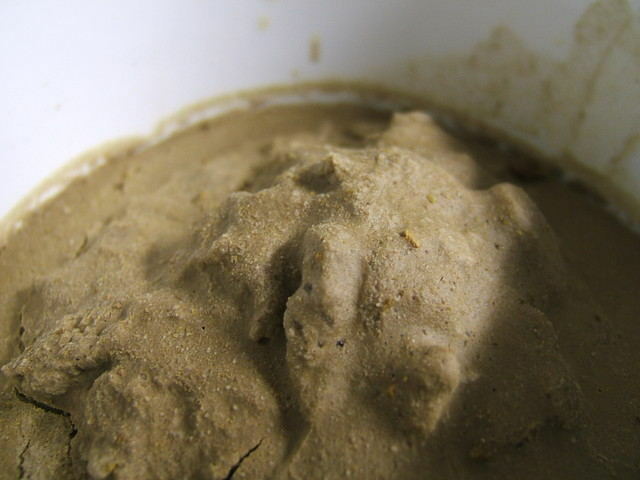 Reslurrying can remove impurities adsorbed to the surface of crystals, and after suitable contact with solvent the product is isolated by filtration. Reslurrying can sometimes be avoided by simply changing the work-up or crystallization procedures. If reslurrying removed water-soluble impurities, including an aqueous wash during the work-up may eliminate the need to reslurry the product. Alternatively, the product may be crystallized from solvents that dissolve impurities that would otherwise be removed by reslurrying. Recrystallization from biphasic solvent combinations may be effective. I'll have to try biphasic recrystallization sometime -- it sounds intriguing. UMich student let go because of associations with grad student unions? Former engineering GSRA Jennifer Dibbern claims that shortly after informing her faculty adviser she was an advocate of forming a student researcher union she began receiving poor reviews and was ultimately dismissed. Dibbern said she was essentially told by her adviser to cease her involvement in unionization efforts. [UM provost] Hanlon, however, says that's not the case and that Dibbern's account of her dismissal, which she shared during a news conference Wednesday, is incomplete. "I have personally reviewed the academic record for this case and I'm convinced that the academic decisions made by our faculty were justified and appropriate," Hanlon said, adding that faculty "followed a thorough and fair process and I want to offer my strong support for them." August 5: In an individual meeting (called to discuss data) Goldman stated that she wanted to go to the MERC hearing Monday as she feared the union would ruin grad education at U of M. She relayed conversations she had with graduate students who were involved in the No Campaign. In the conversation, she referenced the consent agreement reached between GEO and the University regarding terms of election and said she was following the situation “very closely.” She then stated Ms. Dibbern had more data than they could review in that meeting and that they would discuss it the following week. August 8: At a 10am individual meeting, Goldman reviewed the GEO website and spoke about it with Ms. Dibbern. She stated that the MERC meeting will determine whether "we have a research university left." She stated she would leave if the union was formed. August 8: Goldman sent Ms. Dibbern an email that, for the first time, questioned the progress she was making on research and instructed her to stop all outside activity to demonstrate her commitment to her research. person. When Ms. Dibbern asked for clarification, Goldman stated, "you know what I mean." 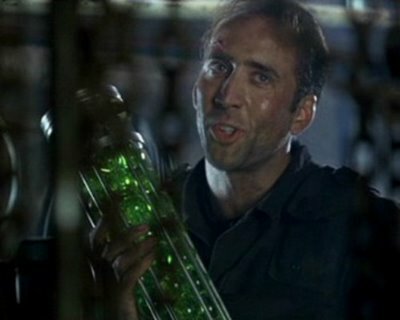 Although Prof. Goldman has a reputation for running a very intense lab, no other student was ever told (to my knowledge) to curtail other outside activities (such as participation in sports, or family obligations). The first allegations made by Prof. Goldman of specific failures were in the email linked above, dated August 8 (after having favorably reviewed Dibbern’s progress just two months earlier). Prof. Goldman fired Dibbern just three weeks later. Professor Goldman seems to have fired Ms. Dibbern not because of any poor performance, but because of her enthusiasm for unionization. Professor Goldman did not follow established procedures for removing a research assistant. I think this story is interesting because it lays out the current balance of power between professors and graduate students at top research departments in the US. If the professor doesn't like the graduate student for any reason, they can be removed (counter to the university's own policy!) and the administration will make it very clear that they're going to back the professor, not the student. Graduate students (and especially undergraduates considering graduate school), be aware of this possibility. Good morning! Between February 9 and February 13, there were 46 new positions posted. Of these, 31 (67%) are academically connected. Milwaukee, WI: Sigma-Aldrich desires a Ph.D. chemist for an analytical R&D position. The Analytical Chemist/Membrane Interface Probe (MIP) Operator works with all aspects of established analytical chemistry methods and testing procedures that are associated with our MIP program. The MIP technique is a direct sensing tool that is used to assess levels of volatile organic compounds (VOCs) in the subsurface. It combines the use of direct push environmental drilling with up-hole analytical chemistry procedures. Primary analytical methods are gas chromatography (GC); however, experience with GC/mass spectrometry is a plus. Strong mechanical and electrical troubleshooting skills are required for this position. Technical and analytical leadership is expected from this position, as well as familiarity and fluency with advanced scientific concepts within the particular discipline. Record keeping, data management, data analysis, interpretation, and presentation as well as competent technical writing skills are required. The position involves periods of extended travel for field work in New England, throughout the United States and several international locations. As much as 50 to 75% of the work may be located outside of Vermont. It sounds like you'll be a traveling analytical chemist. Sounds interesting. Newark, DE: Air Liquide is searching for a B.S./M.S. analytical chemist for its new R&D center. Description: "Develop solutions for analysis of critical impurities in pure gases and major and minor components in process gas stream in collaboration with Air Liquide operational units." Sounds important. Pay is a little wanting? Kalamazoo, MI: Kalsec is searching (once again) for a Ph.D. chemist with expertise in natural products extraction chemistry. "Advanced hop products" sounds like an interesting area of research. Columbus, OH: Chemical Abstracts Service is searching for people to fill CAS databases. B.S./M.S. chemists with strong "Biochemistry, Inorganic, Organic, Organometallic, Polymer, Applied or Physical chemistry emphasis." 49k-58k? Oh, dear. Greensboro, NC: Bennett College is a HSBC for women; it's looking for a tenure-track assistant professor of chemistry, oriented to inorganic and physical chemistry. Ability to grow an undergraduate research program is desired. Charlotte, NC: UNC-Charlotte desires a Ph.D. lecturer in organic chemistry; a 3-year term is initially offered. Espoo, Finland: Aalto University is searching for a professor of polymer chemistry (and technology). Corvallis, OR: Oregon State University wishes to fill 5 (five!) open spots for professors of analytical and materials chemistry. New York City: Columbia University has postdoctoral openings in the Columbia University Energy Frontier Research Center. Want to intern at a Bay Area pharma company? Desired: A sophomore, junior or senior chemistry major in college. Please send me (chemjobber -at- gmail/dot/com) your CV and a research summary. UPDATE 21 FEB 2012: The position is closed to CV/research summary submissions. Thanks! Federal prosecutors have unveiled charges that over a period of years, five people and a Chinese company—all acting in concert and at the behest of the Chinese government—stole DuPont’s technology to manufacture the white pigment titanium dioxide. Two of the people charged were longtime DuPont employees. An industry analyst says that the firm’s superior process has led it to be a global leader in TiO2 production. [snip] The indictment names ex-DuPont employees Tze Chao, who worked for the company for 36 years until 2002, and Robert Maegerle, a process engineer who worked for DuPont for 35 years until 1991. One Pangang Group employee was charged. It would be fascinating to know which parts of MICE were at it again. Think of things other than wages that translate to costs. Infrastructure: roads, electricity, finance, education, talent, Internet, global shipping, and energy. Policy: stable governance, intellectual property protection, visitation and immigration, taxes, and government investment. Get even some of those elements wrong and your cheap labor advantage evaporates. The state of these variables is largely derived from government policy. And this is the part we—as Americans and as the American Chemical Society—can do something about. I’ve written previously in this space about the ACS Business Climate position statement (C&EN, Sept. 6, 2010, page 71). My summary question is this: The next time a company wants to build a laboratory and it could be anywhere, why not here? This is where we—as the U.S.—have to sharpen our game and make this the best place on Earth to locate a laboratory or a factory or a business on a total cost basis. This is not an unknown strategy. I know that when companies decide that they might build a facility in a specific region of the US, there's traditionally some kind of visit from the local economic development commission that will lay out what that city/county/state will do for the company. There's typically (perhaps unwisely) some kind of promise of lowered, deferred (or altogether removed) taxes, some sort of comment about the relatively low wages of the area and the high level of education of the workforce. It's my impression that the US doesn't have an office at the federal level that coordinates that kind of information; then again, maybe there is. It would be interesting to know what sort of competition that would engender among the different developing/developed nations of the world. Five years ago, your colleagues would have laughed you out of the lunchroom if you suggested that a new ethylene cracker would be built in the U.S. And if you suggested it would be anywhere but Houston, they’d throw a net over you. Now, because of the new paradigm of abundant shale gas, crackers are planned for—wait for it—Pennsylvania. Natural-gas-based chemistry today has a huge competitive cost advantage over oil-based chemistry on the world market. For that reason, gas-based ethylene derivatives have had boom years recently because of exports. There is the chance that, if we get the regulatory aspects right (both for environmental protection and cost), we could take the hot hand in chemicals back from the Middle East. The game can, and has, changed. Good news for Pennsylvania -- I hope it pans out. MissMSE is 1 year old! David Perrey reminds us that drugs are expensive -- I hadn't forgotten. A STEM worker shortage, Lisa asks? Lisa Jarvis talks about GSK's small R&D units. Carmen covers a chemical romance novel -- I am not kidding. Practical Fragments continues to put out interesting FBDD posts. The Organometallic Reader is pretty frickin' awesome. Apropos of nothing, a link to a favorite Chris LeDoux cover of a Springsteen tune. Did I miss anyone? Have a good weekend! UPDATE: I forgot SeeArrOh's new Knights of the Organometallic Round Table post. I've had a recruiter call me recently at work, lying to get past the receptionist to me. * I'm annoyed to be interrupted in the lab and we don't really have any private phones in the building. I'm even more irritated when the recruiter attempts to quiz me about the structure of the company. The intercom buzzes and I pick up, annoyed. "Line one for the chef," says the hostess. I push the blinking green light. It's a salesman, wanting to sell me smoked fish. I answer all sweetness and light, lulling him into the bear trap in the Bigfoot style: "So let me get this straight," I say, after he's jabbered away about his full line of delicacies, me trying to sound a little slow and confused, "you want to sell me food, right?" "Yes!" comes the reply, the salesman sounding encouraged by my interest and apparent stupidity. "And in general, you'd say," I continue, "you have, like, a lot of restaurant accounts, -- in fact, you'd probably say that, like, you are in the business of servicing restaurants... and chefs in particular?" "Oh, yes!" says the witless salesman, beginning a litany of the usual prestigious accounts, the names of other chefs who buy his fine smoked sturgeon, salmon, trout and fish eggs. I have had enough fun and cut him off cold. "So... WHAT THE F--- ARE YOU DOING CALLING ME IN THE MIDDLE OF THE F------ LUNCH RUSH?!" I scream into the phone, smashing it abruptly into the cradle. Recruiters, I love you. You have a hard job and I am in tremendous sympathy. I like hearing from recruiters, because I like trying to help people find jobs they want. But calling introverted scientists while they're concentrating on working at work while they're surrounded by their coworkers and cannot have a private conversation is really annoying. I want to help you -- don't start by unintentionally irritating me. *Who do you think I'm more loyal to, the person I work with every day or you? Changing the culture of an institution—especially one as intractable as chemical academia—is extraordinarily difficult. But so long as we forgo meaningful changes in favor of cosmetic ones that we don’t even bother to sustain anyway, we will continue to experience frustration and tragedy. One wonders what magnitude of disruption is necessary for our community to commit itself to improvement. Apparently, it is much greater than the death of a twenty-something student. The gun to the head: Funding is added or taken away, new laws are passed, lawsuits are lost (or won). Change is forced on the institution. From the top: Leadership decides (for whatever reason) to make changes. Examples: handover at the White House between presidencies, the transition at Apple between Steve Jobs and Tim Cook, Microsoft's late-90's pivot to the Internet. Voluntary change: People within the institution have a change of heart, decide to alter their direction. Examples: I can't really think of any (doesn't mean there aren't). If enough people like Paul have faculty positions and attain high enough positions in academic chemistry, will things change? Probably. I think change from the bottom will be slow and painful, but has the best chance of becoming permanent. There is, of course, the Langerman/Benderly approach to academic chemical safety: that funding and tenure be threatened in the case of bad safety records. I am on the record as seeing it as (at best) a useful bad idea. It's a Desert Eagle approach -- it will be interesting to see if it suffices. Need some unsolved problems? Try these! It's apparent to me that higher-end pharma products don't really fit well into this viewpoint. Uh-oh. Good morning! Between February 7 and February 8, there were 24 new positions posted on the ACS Careers website. Of these, 6 (25%) are academically connected and 7 (29%) are from Kelly Scientific Resources. Pleasanton, CA: Clorox is back, looking for chemists. 3 Ph.D. positions for an antimicrobial scientist, an oxidation scientist and a colloid expert. Sounds good. Tuscon, AZ: Sion Power Corporation is a battery start-up; they're looking for a cathode development scientist. Ph.D. in chemistry, materials science or chemical engineering desired, with 10+ years experience. And the bidding starts at $110,000, I'm guessing. For more than 25 years, RJ Lee Group's scientific and investigative resources have provided the competitive edge by defining solutions. As the field of Industrial Forensics advanced and embraced more sophisticated and complex issues such as nanoparticles and electronic materials, RJ Lee Group determined that the need for in-depth resolution was essential and that a single solution was no longer acceptable. Today RJ Lee Group’s expert scientists address these issues and can investigate the entire product life cycle including regulatory compliance in the workplace. Sounds like consultants to me; here's their case studies. Nevertheless, they're looking for a director of their analytical lab. Ph.D. with 10+ years experience desired. Carlsbad, NM: Carlsbad Environmental Monitoring and Research Center is looking for a M.S.-level radiochemist. A broader look: Monster, Careerbuilder, Indeed and USAjobs.gov show (respectively) 275,750, 3,097 and 53 positions for the search term "chemist." In SeeArrOh's wanderings on the Internet, he happened to come across this table in a rough draft of a paper intended for a high-impact journal. It's nice to see such structurally diverse molecules be subjected to this group's oxidation technique. That crack (lower left) could become a ravine (or a highway). Displacement is by far the most efficient mechanism and under ideal conditions would cause the washing liquor to act as a piston driving the mother liquor out of the cake without any dilution. This is clearly utopia although a high degree of “piston or plug-flow effect” can be achieved with a careful preparation of the cake and a careful application of the wash liquor. The trick lies above all in the careful application of the washing liquor to the saturated face of the filter cake. What happens if you got the chance to force your rinse through the cake with pressure? It must be clear, but is often ignored, that washing at too high a pressure differential only leads to poor efficiency. Too high a pressure almost always leads to bypassing. Although the ideal cake has an even structure, no pinholes, and no cracks and lies firmly bedded against the retaining walls, we are not living in an ideal world and to some degree all cakes will have these faults. Forcing liquid through the cake at unnecessarily high pressures only makes matters worse. A pinhole will become a hole, a crack a ravine and if the cake does not bed down perfectly, the washing liquid will make a highway of the gap. [emphasis CJ's] In addition, high pressure differentials reduce the contact time. In all cases therefore the optimum pressure differential is the lowest possible. You didn't know that washing the filter cake in a Buchner funnel had so much behind it, did you? Leave it to the chemical engineers to understand this stuff. Barry A. Perlmutter, "A Treatise of Filter Cake Washing Mechanisms In Pressure and Vacuum Filtration Systems." To my undergraduate and graduate student readers: don't do this! I had way too much going on. I was in a folkloric dance troupe, working at Rite Aid and manning a health hotline. I thought lots of extra-curriculars would get me into a good law school. But my grades started to suffer; I was put on academic probation and my financial aid was suspended. I wasn't able to ask for help. I wanted to fix my problems secretly without disappointing anybody, so I robbed a bank. I still ask myself how I got the idea. I was desperate. I thought, "no one will know." I'll never speak of it. It'll be just one time and I'll just move forward. I walked in and gave the teller a note. Some of what you see in the movies is true. Tellers are supposed to acquiesce to whatever you ask. I got a few thousand dollars and it all went to pay for school. I thought, "Let me just try this one more time, so I can pay off a little more debt." It didn't work: a judge sentenced me to 30 months in prison. Just in case you needed to hear it from me, don't do that. Good morning! Between February 2 and February 6, there were 49 positions posted on the ACS Careers website. Of these, 14 (29%) were academically connected and 14 (29%) were from Kelly Scientific Resources. Santa Rosa, CA: Thermochem is a testing laboratory; they're looking for a B.S. chemist with minimum 5 years experience with gas chromatography. Monroeville, PA: PPG Industries is looking a Ph.D. inorganic chemist to work on water purification technology. So Nalco has competitors, huh? Contribute to writing protocols, procedures & reports, work productively in a cross functional team environment, develop awareness of process economics, timelines, environmental (Green chemistry) & process safety, & comply with applicable regulations in accordance to SOP's & policies. Analyze API physical property with TGA & DSC etc. Introduce & utilize new technologies to improve productivity in the lab (e.g. react-IR & flow reactor). Interpret analytical data of scale up batch, trouble-shooting & coordinate workflow between process research & scale-up interface. International travel required. Must possess at least a bachelor's degree or its equivalent in Chemistry or a related field & at least five years of work experience in Chemistry/Research field. In the alternative, a master's degree or its equivalent in Chemistry or a related field & at least three years of work experience in Chemistry/Research field would be acceptable. College coursework, project or work experience with the following: advanced chemistry knowledge of stereoselective synthesis & heterocyclic organic compound; experience using a parallel synthesizer or automated reactor, & programed purification system; experience with using high technological instruments such as NMR, HPLC-MS, GC-MS, HPLC-prep; experience working on air-sensitive chemicals under inert atmosphere, e.g. 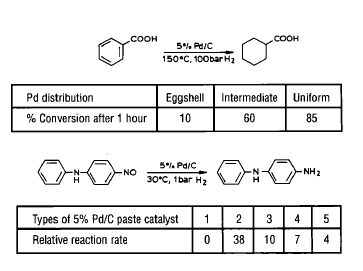 preparation & transfer of organometallic catalysts using glove box; experience in synthesis & purification of inorganic compound such as a metal catalyst for organic reactions; experience using pressurize reactor such as for hydrogenation; experience with basic principles in drug design & development; & experience in design & synthesis of chiral lignad [sic] such as chiral N-heterocyclic carbene & phosphine ligands. Any suitable combination of education, training &/or experience would be acceptable. Why not just send a letter to Professor Buchwald and save the $600 you spent on an ad? Sacramento, CA: AMPAC Fine Chemicals would like to hire a B.S./M.S./Ph.D. chemist with at least 6 years of industry experience. Polymer and organic experience is desired for this position; experience with thermoset and thermoplastics techniques desired. West Lafayette, IN: Endocyte is searching for a Ph.D. analytical chemist for QC/cGMP work. Go Gamecocks: The University of South Carolina is searching for an assistant professor of chemistry; analytical, instrumental, general courses to be taught. Monmouth, IL: Monmouth College is searching for candidates for a 2 year temporary position. Ph.D. needs to be completed by August 2012. Riverdale, NY: Manhattan College is looking for an assistant professor of physical chemistry. Ph.D. + postdoc is desirable. Seattle, WA: The University of Washington's EH&S laboratory is searching for a Ph.D. analytical chemist with 3 years experience in lab management. 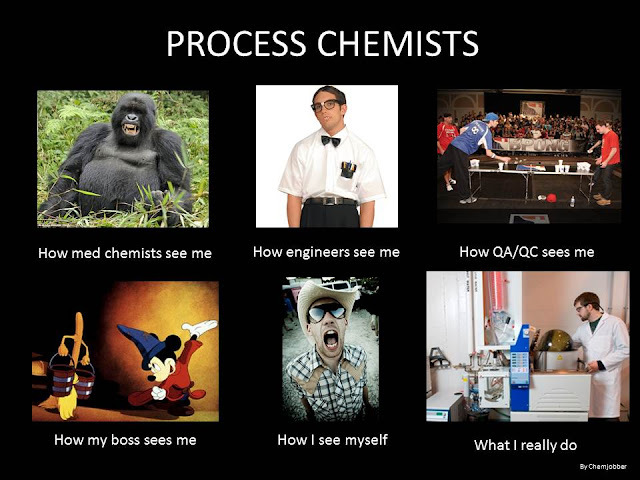 GC-MS, LC/MS, HPLC experience desired. Buffalo, NY: The Department of Chemistry at the University of Buffalo is looking for a 3 year lecturer position. You'll have a few Bills games to go to, anyway. Our client, a highly successful specialty chemical company located in the central United States is seeking research and product development chemists to join their team. This small cap company develops products and processes used in the semiconductor industry. A global leader in its applications the company reached record revenues in 2011 with sales increasing 40% from the prior year. As a trusted industry partner to their customers our client continues to look for new ways to meet market demand through reliable and innovative solutions. With strong, foreseeable growth for many years this company continues to aggressively reinvest in R&D putting a significant premium on new technology and products. We are looking for formulation chemists that have a minimum of three (3) years applied industry experience in wet chemistry. Understanding of colloidal science, inorganic chemistry, surface science, particles and polymers is preferred. A PhD in Chemistry or related science is required. The ideal candidate will have experience working with customers solving problems and offering applicable solutions. These are roles designed for entrepreneurial scientists who enjoy working in a fast-paced collaborative environment that is results oriented. Our client operates in a new state-of-the-art facility that offers numerous amenities for supporting a good work-life balance. Career training and promotion opportunities abound as well as an attractive compensation package with relocation assistance if needed. If you fit this profile and are interested in learning more please email to mbarrett -at- dhrinternational/dot/com. up here? I'm a biochemist! I drive a Volvo!" Saphon Hok, a chemist at Lawrence Livermore National Laboratory (LLNL), in collaboration with the Swedish Defence Research Agency, has been using impurity profiling to link chemical threat agents to the method used to make them. At the American Chemical Society national meeting in Denver last fall, Hok reported that he could differentiate among four production routes to make the nerve agent known as Russian VX. He has done similar work on sarin, VX, and the blister agent sulfur mustard. “I go through all the possible ways an agent can be synthesized, and then I go into the laboratory and make these compounds on a small scale as crudely as possible,” Hok explains. “We try to mimic someone who is trying to do this synthesis in their backyard or in their garage.” He then analyzes the compounds using liquid chromatography/mass spectrometry, gas chromatography/mass spectrometry (GC/MS), and nuclear magnetic resonance (NMR) spectroscopy. The data, he says, reveal different signatures that pinpoint the production method used. I don't think I have the technique required for this kind of chemistry. Good on them. What are your best job interview tips? Process Wednesday: Vortexes aren't good?